Just a programming note, a reminder that Japan plans to launch the Venus orbiter Akatsuki and the solar sail IKAROS today at 21:45 UTC. I plan to be watching their webcast, which is supposed to begin at 21:15 UTC. I will probably not post anything here in real time; for as-they-happen updates, watch my Twitter page. I'll do a wrapup post here after the launch (or scrub, if that happens). Here's a photo of the rocket, ready to go; it was taken yesterday, a little more than a day before the planned launch time. The countdown is now proceeding on schedule. The first and second rocket stages are (as of a couple of hours ago) fully loaded with liquid oxygen and liquid hydrogen, and the radio system checks are complete. 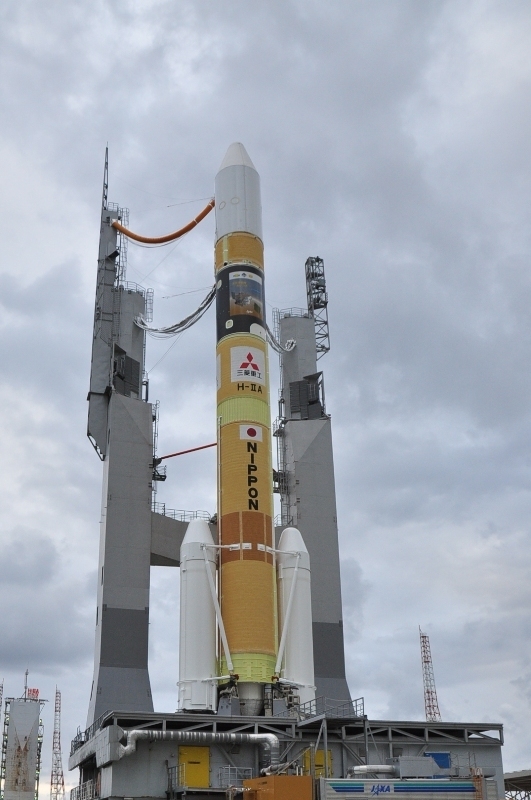 Taken on May 17, 2010, about 24 hours before the planned launch of Akatsuki and IKAROS toward Venus. They are stacked aboard an H-IIA rocket.